Following on from the Mac-compatible Core X eGPU line launched in May 2018, the Core X Chroma has the same basic design as its predecessor, consisting of a black aluminum enclosure with a side window. Just as with the first version, it features lighting effects to illuminate the graphics card and the front, but this time using Razer's Chroma lighting system capable of producing 16.8 million colors. Inside, the 650-Watt power supply used has been switched out for a 700-Watt version, enabling it to handle graphics cards with higher power requirements of up to 500 Watts. Power delivery is also provided to MacBooks using the Thunderbolt 3 connection, at up to 100 Watts. A tool-less drawer-style slide and lock mechanism is used to install the graphics card into the PCIe slot, secured with a single thumbscrew, with the enclosure capable of accommodating physically larger "3 slot-wide" cards. Perforated sides and cooling fans are also employed to keep the card and the chassis at a thermally optimal level. As well as Thunderbolt 3, the enclosure also offers Gigabit Ethernet connectivity, and four USB 3.1 Type-A connections. 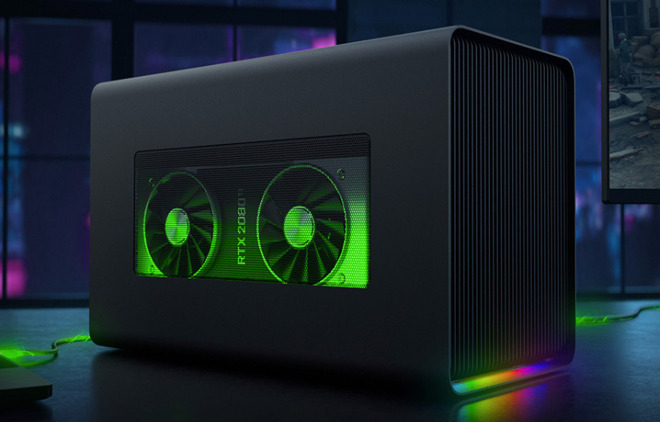 According to the company, the Razer Core X Chroma requires a Mac with Thunderbolt 3 running macOS High Sierra 10.13.4 or later, and a compatible AMD graphics card. The list of compatible chipsets for macOS includes the Radeon RX 470, 480, 570, 580, WX 7100, WX9100, Vega 56, Vega 64, and Vega Frontier Edition Air. The enclosure is also compatible with Windows 10 notebooks, with the card compatibility list extended significantly with Nvidia GeForce and Quadro GPUs. For these and other improvements, the new enclosure costs $100 more than the Razer Core X at $399 without a graphics card. At press time, the Core X Chroma is available for purchase at Razer.com, with additional retailers expected to carry the new enclosure soon.